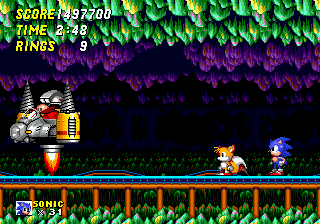 With Drill Eggman II (ドリルエッグマンII), found in Mystic Cave Zone, Eggman's in another Drill Car, but this time it actually drills. What do I mean you ask? Well, Eggman will drive forward a little ways, allowing you to attack him, then he'll rise up and drill through the ceiling. Upon doing this, Eggman unleashes a storm of pointy objects that rain down you. Simply avoid these objects and hit Eggman when he descends from the ceiling. The spikes that rain down WILL hurt you, but the rocks wont. Sonic the Hedgehog 2 $57 $30FA4 $316EC $86B6E (Nemesis format, 204 Blocks) $???? ?